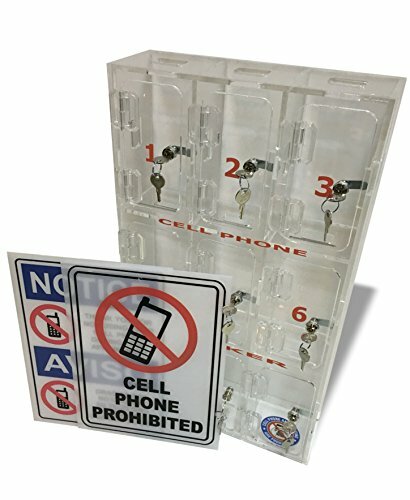 MODEL A- Cell phone storage lockers are made from ¼" thick clear acrylic. This is unique because you can see through the acrylic.This is wall mounted unit only. This is appropriate for the workplace. It is safe for cell phones. It has openings for charger cords so each phone can charge while it is in the locker. Each door has an individual camlock which comes with two keys. All door locks are the same. This is ideal for factories, military, law enforcement, government, contractors, fitness centers, swimming pools, medical buildings, schools, and country clubs. Hardware and mounting brackets included. This ships fully assembled. Product dimensions: 12" x 21" x 3.5". This also comes with 2 white acrylic signs. Please refer to the photos (Bilingual No Cell Phone and Cell Phone Prohibited). The signs come with hardware. Product dimensions: 8 7/8" x 12". If you are looking for the same unit with different locks on each door see Model B. Product dimensions: 12" x 21" x 3.5". Each door has an individual camlock which comes with two keys. All door locks are the same. If you have any questions about this product by Acrylic Mega Store, contact us by completing and submitting the form below. If you are looking for a specif part number, please include it with your message.